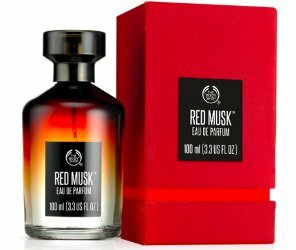 The Body Shop has launched Red Musk, a new fragrance for women. Ready to spice things up? Discover the hot NEW Red Musk™ collection, an intensely different feminine fragrance that is heating up the perfume establishment with its smouldering blend of spiced musk with hot notes of pepper, cinnamon and tobacco – and no flowers! Red Musk was developed by perfumer Corinne Cachen. The Body Shop Red Musk is available in 60 and 100 ml Eau de Parfum and in 30 ml Perfume Oil. I look forward to trying this one…a tobacco cinnamon sounds great to me. That sounds nice.. There used to be a Body Shop store close to me but it’s been gone for a few years now. I just looked on their website and apparently the only store in Houston is in the airport. I am puzzled by the box and will be interested to see if it’s being used in the US. That image is from the Dubai store, I think. Tried this yesterday and thought it wasn’t too bad, although uncomfortably close to Avon ingredients quality or rather lack thereof. I have tested room sprays with more depth. Looks interesting… I love tobacco and spicy scents, might be worth a try. The name confuses me a little, when I hear “red musk” I think of dragon’s blood resin. I went into the Body Shop on Broadway this past Saturday to give this a try. The official launch date is not until October something so the sales assistant was kind enough to bring out the store tester from the back office so in order for me to preview the scent. Apparently, the tester is not supposed to be avaialble for customers to test until the official launch date…such protocol, haha. The fragrance itself smelled like bland nothingness. Literally, none of the notes listed appear to be present. Disappointing. I was excited to try something from the Body Shop since I have not even ventured into one since the early 90’s. Good for me as I can just stick to my niche quality purcahses and continue eliminate cheap thrills from the budget.